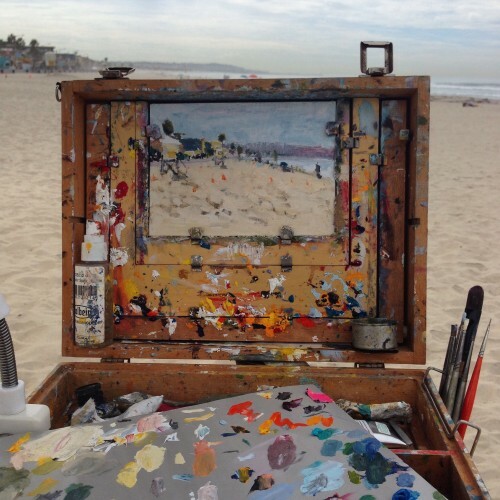 Painted on the beach in Coronado last week, before I left San Diego for a few days in Las Vegas. Just got around to photographing it today. I’ve been playing around lately with a more conventional approach to Impressionism. In this piece, Pissarro’s ‘petite tache’ and palette and what all. 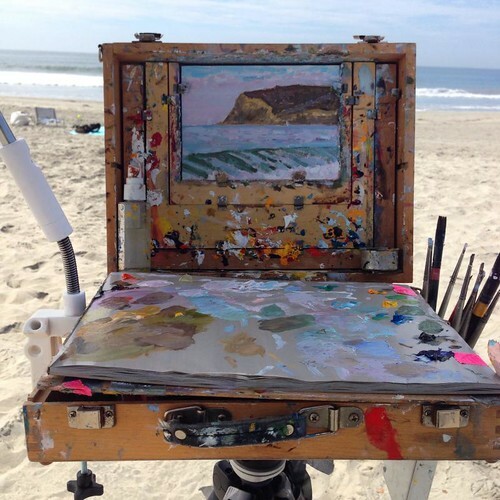 My approach to painting doesn’t tend to come from that place- I got here via a winding path out of modernist abstraction that eventually led to being on a street corner with a paint box. 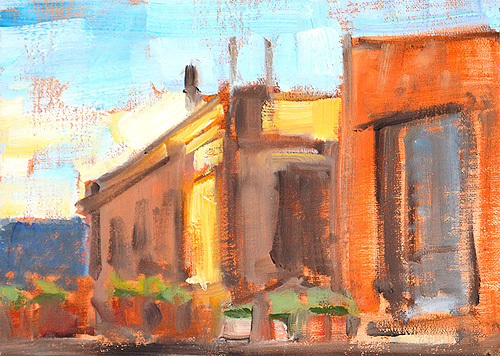 So it’s fun to tinker with the style, so familiar from childhood visits to the National Gallery of Art in DC. We’ll see if it becomes a thing. 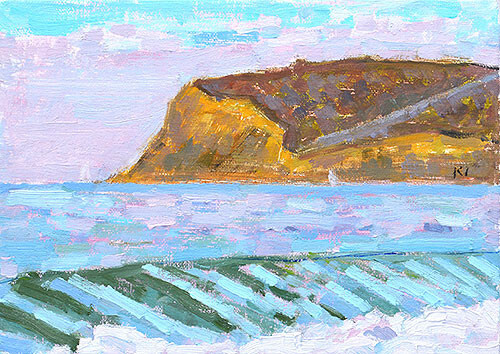 This entry was posted in Landscape Paintings, San Diego Paintings, Seascape Paintings and tagged 5 x 7 inches, beach, coronado, impressionism, landscape, ocean, oil on linen on panel, plein air, san diego on September 20, 2015 by Kevin. Painted on location in PB. 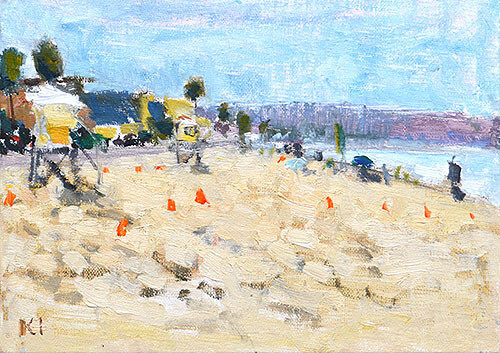 This entry was posted in Daily, Landscape Paintings, San Diego Paintings, Seascape Paintings and tagged 5 x 7 inches, impressionism, oil on linen on panel, pacific beach, pb, san diego on September 11, 2015 by Kevin. Painted on location in Barcelona. This is the view from my apartment on the 5th floor of a building from 1770. That’s right, five floors of tiny winding stairs. With my easel and tripod, and on the way back up with barras de pan, I barely fit in that staircase. Fortunately, I have arch support insoles. 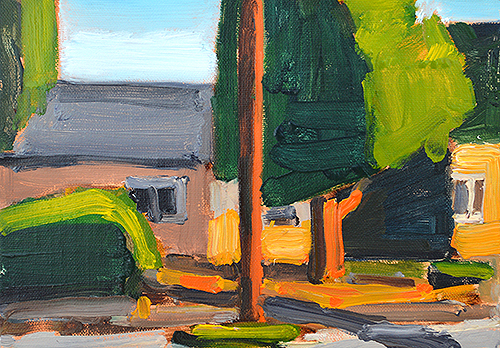 This entry was posted in Landscape Paintings, San Diego Paintings and tagged 5 x 7 inches, barcelona, catalunya, impressionism, oil on linen on panel, roof, san diego, spain on November 4, 2014 by Kevin. 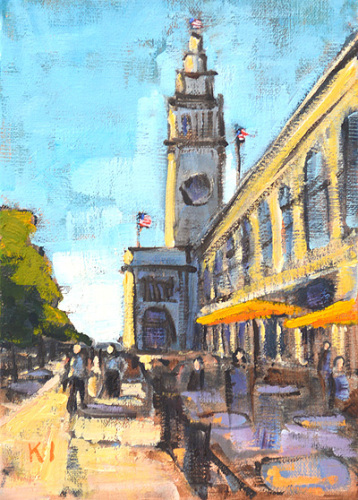 This entry was posted in Landscape Paintings, Urban Landscapes and tagged 7 x 5 inches, american flag, california, embarcadero, ferry building, impressionism, oil on linen on panel, san francisco on October 14, 2014 by Kevin.